Location: Prominently sited on the east bank of the River Clwyd to the SE of the town. 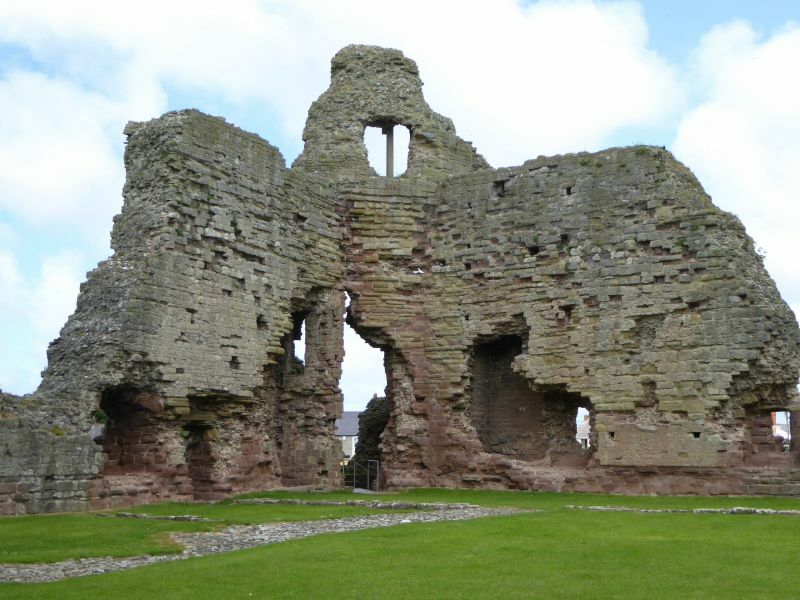 Building of the castle at Rhuddlan followed the capture of the borough (originally founded c1073) by Edward I in 1277. Both the town and its existing castle were re-sited, and newly planned as an integral development. Work on the castle began in 1277, and continued until the mid 1280's, with alterations carried out in the early C14. The chief master mason was James of Saint George, and some early C14 work was carried out by Richard of Chester. The castle surrendered to Parliament in 1646, and was slighted in 1648. Concentric plan with inner and outer wards. The outer ward is enclosed by a wide dry moat, and is protected to the S by a river wall and tower. The moat was originally crossed at two points - at the Town Gate (the present entrance from Castle Street), and at the SE at the Priory Gate (converted into a turret in 1300). The sides of the moat were revetted in stone, most of which survives. The outer curtain wall is fragmentary, but remains of turrets containing steps leading down to former sallyports in the moat survive. The ward slopes down to the river to the SW, and at its furthest point is the square, 4-storeyed Gillot's Tower, with a postern alongside it. The inner ward is of lozenge plan, and has a single circular tower at the N and S corners, and double-towered gatehouses at the E and W angles. Curtain walls survive to the level of the wall walks between the towers, and have embrasured slits at ground level. The parapets have largely disappeared, but a fragment of battlement survives in the NE wall, and the SW and SE walls retain traces of central corbelled turrets. The towers were 4 storeyed, and the S tower, and the W gatehouse towers survive almost to their full height. E gatehouse has portcullis grooves and gate chases. The original system of loopholes survives in its N guardroom, interrupted to the S by the insertion of a fireplace at the beginning of the C14. Inside the ward, the domestic buildings were of timber, and have all been lost. Scheduled Ancient Monument: Ref. F4. On the corner with High Street. At right angles to the road, on a corner opposite Castle Street. At right-angles to the Street, next to Parliament house and near the corner with Parliament Street. Spans the river Clwyd to form the only access to the town from the W.
At the entrance to the church yard to Saint Mary's Church, set back from the street. Set back in a walled garden, near the corner with High Street.